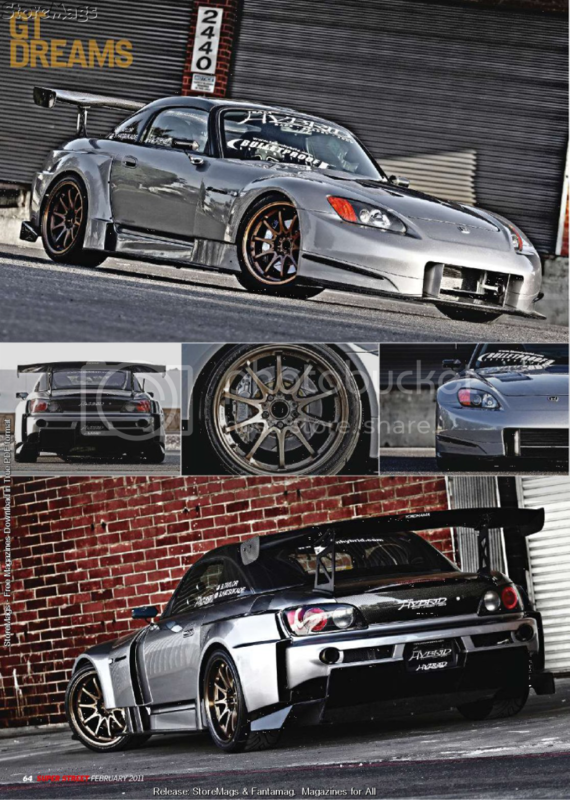 Congratulations to SD Chapter's Bobby Taylor's 2003 Honda-Amuse-Widebody S2000 in a 4 page full feature in Super Street Magazine's February 2011 issue, pgs 062-065. Only 7 days into the new year, our team has already landed another full feature in one of the most respected and at the moment, best selling domestic import tuner magazine. Remember, 2011 will be no different. In Team Hybrid, a super star is born everyday and thanks to SD Chapter's Ryan Romaine for finding this gem. Super Street Quote #1: "Bobby Taylor, the owner of this 2003 Silverstone Metallic AP1 sat speechless as Team Hybrid president James Lin snapped picture after picture with his digital camera." Super Street Quote #2: "He was either pumped because he was a huge Powerhouse Amuse fan, or that the newest member sitting next to me would help continue the storied legacy of Lin's baby: Team Hybrid." Super Street Quote #3: "After a close look at Bobby's S2000, it's easy to understand why the Team Hybrid founder was so excited...it doesn't have the tucked/saved bay and custom wiring like most of the more popular Honda builds these days-it just doesn't need it. It's completely Japanese-inspired, and while it may never be a Super GT race car, it does share one common characteristic with them-the most import characteristic: Function. This Honda was built to perform." Again and again, the level of respect and luv we have from our industry insiders in marketing and selling their products or magazines continues (16+ years)... Our team resume and current scoreboard continues to show why we are the finest, most well-rounded, 1st to many of the import accolades, most recognized and most innovative team in import history. Magazine & online scoreboard as of 01/19/11: 1 feature article, 2 online feature and 1 event coverage. The new year just started and our team already has 1 full feature article in a major import magazine, 2 online feature and 1 event coverage in our pipeline. As promised last month and I promise you once again, there is still MORE to come. Bigger things are coming and in store for our team in 2011!